Save time and money by using our remote server management services, allowing you to focus on more important aspects of your business. Our experienced and certified team will maintain and troubleshoot issues for you 24x7. services team can give your business, the “Peace of Mind” knowing that we will keep your IT running. Our Linux and Windows server management team has vast experience in managing servers on either Linux or Windows platforms. Our experienced and highly-trained industry certified engineers are always available at beck and call to support. Managing your own servers involves both time and money. Typically, you may need a full time staff, constant training for them to keep up with the rapidly changing technology and often you will focus more time managing your technology than your business. 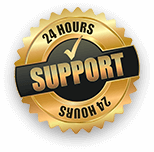 If you need someone reliable for a proactive remote server administration; then ByteCARE - 24x7 remote server administration services are just for you. We constantly monitor your server’s performance, network traffic, disk space utilization, running services and much more. Our proactive remote server management every month also includes complete server audit, monitoring event logs and resolving problems, patch management, security audits and more. Our certified support engineers administer and maintain your servers for maximum stability, security and uptime. Can you manage or secure my servers even if I don’t host them with a data centre? Which server platforms do you support? We support all popular flavours of Linux like CentOS, RedHat, Fedora, etc. as well as Windows server platforms like Windows 2008 R2, Windows 2012 R2, etc. What are the common server management tasks performed? How do you monitor the servers? We install a monitoring agent on your server with certain pre-defined checks. This agent sends back the vital statistics to our Network Operations Centre (NOC). The servers are monitored from two different geographical locations and the service is automated, but human intervened as well. My IT infrastructure is behind a firewall and cannot be opened to the Internet. How do you monitor in such cases? We assist you by setting up a very basic – small footprint – probe server inside your organisation behind the firewall. The probe server gathers the vital statistics and sends back the data to our central monitoring servers. The connection between the probe server and our central servers is over a secured channel. How long does it take to start the services once I sign up? Generally, the account activation and related formalities of signing the SLA, deciding the escalation matrix, etc. take about 48 hours. Once these formalities are completed, we proceed through initial server audit for base lining, performing security audits, security implementations once approved by you, adding the server to our monitoring system, updating our CMDB and then finally adding your account to our internal support desk to ease and smooth communications.